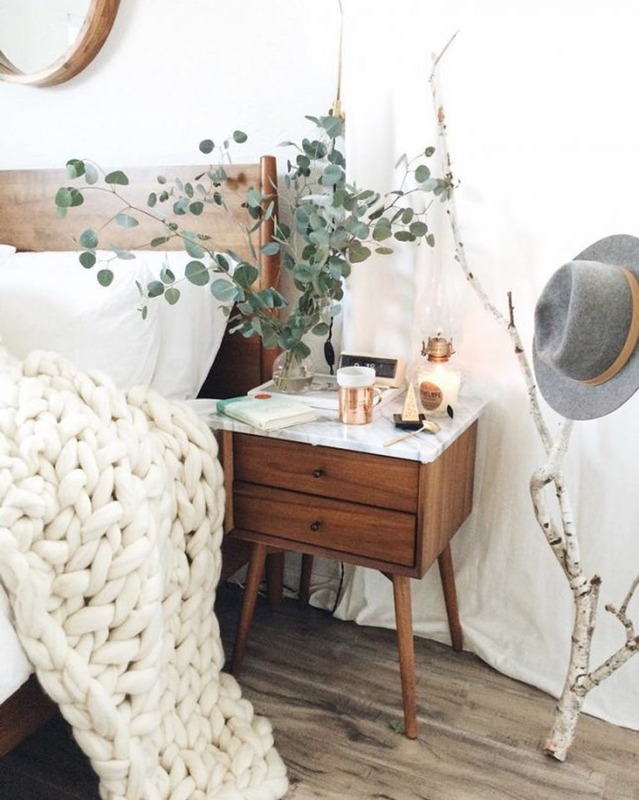 Hello and welcome to a less opinionated blog post about where I'm getting my inspiration for my room from and how I plan to go about making it a reality. So to begin with I obviously had to create a pinterest "roomspiration" board, I began to fill it with everything I loved and the perfect colour scheme. I knew from the get-go that grey, white, and dusky rose/rose gold was the way to go for me. Call me cliche but those are my favourites. Once I had gathereed a few inspiring images I decided to analyse how I could recreate some of my favourite features, amongst my own room. This photograph was one that immediately stood out to me due to the stunning contrast between the dark grey and white on the walls. 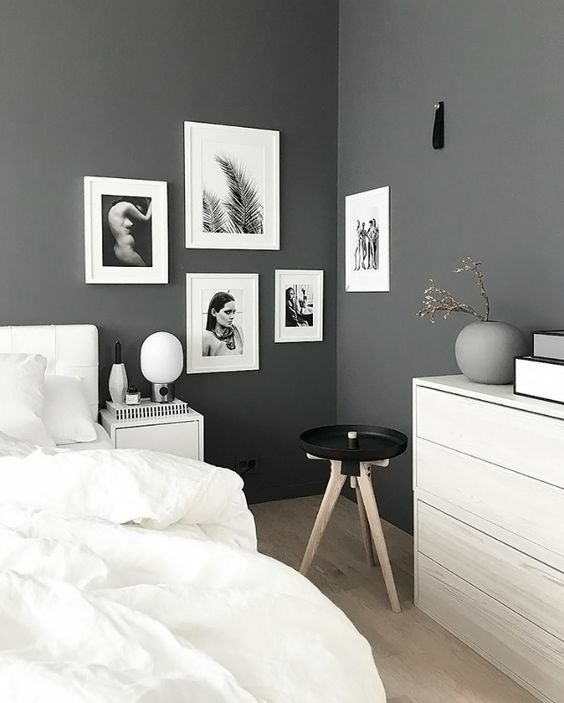 I have always had one feature wall in my room which was previously dark brown, but as soon as I saw this, I knew it had to be dark grey. As for the pictures, I already own some stunning prints by the lovely designbydani1992 on etsy and I have always wanted to frame them and make an artistic display of them, this is the perfect chance. I have bought: two small black frames for my black and white prints to go on my white walls; two small white frames for my pink prints to go on any walls; and finally two large white frames for my two largest prints to be the centre pieces on my grey feature wall. This was the photograph that encouraged me to incorporate pink. If you know me, you know I am a big fan of pink anyway, but I was originally a little nervous to add some pink in case I grew out of the colour and decided I was no longer living for it. However, after literally having hearts in my eyes when looking at this photo, I decided that a pop of pink wouldn't hurt anyone. 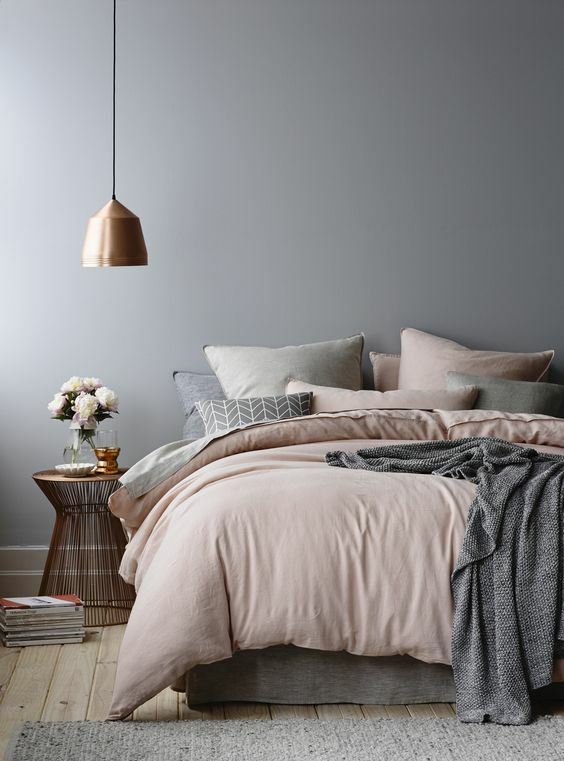 I adore the velvety feel and look of pink cushions and plan on buying 2 new pink and 2 new grey cushions to spruce up my bed and add a pop of colour, all cushions will be different to grasp that pretty, uneven look. WOAH, you may be thinking. And yes, I thought the same thing, but this is the photo that had me reaching for the rose gold. (I am aware this photo is more of a copper colour). 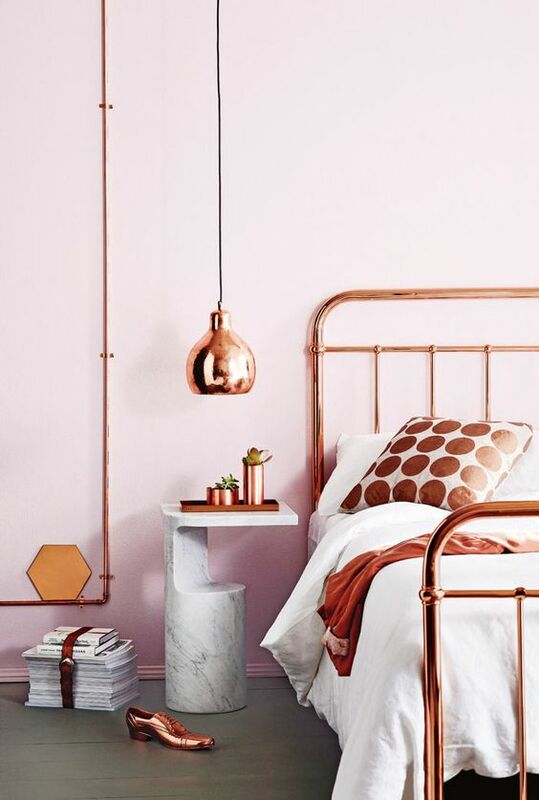 This inspired me to add a few metallic rose gold/coppery bits and bobs which i'm not overly fussed about buying straight away as i'd rather not buy random things for the sake of them being rose gold. However, I already own a stunning gold, metal, flower decoration which I have the ability to spray-paint a more rose gold colour, I'm just searching for that perfect colour spray-paint to help me out. Finally, this picture really caught my eye with the pop of green life next to white. Due to the fact that the rest of my walls will be white, and some new furniture may also be white, I thought that a splash of plant life might just be the cherry on top of this custom made cake. However - as a busy, lazy, tired teenager - keeping a plant alive would probably last all of 6 days before it popped its clogs. So I decided to take a trip to the grand ole IKEA and have a nosey around their fake plant section (which may I say is rather extensive) and picked myself a cute little bobbly, droopy plant with character to bring my room that air of life (or plastic as it seems). So, to wrap this off i'd like to say that there is nothing I recommend more, when decorating or looking for any kind of inspiration, than making a pinterest board! If you'd like to see another post like this with final pictures of my actual room, and how I made it look the way it soon will, head over to my instagram @velvetnavy where I do polls and interact more with readers. Thank you for reading this post, feel free to subscribe using the button below or at the top of the page. I look forward to have you reading my next post.